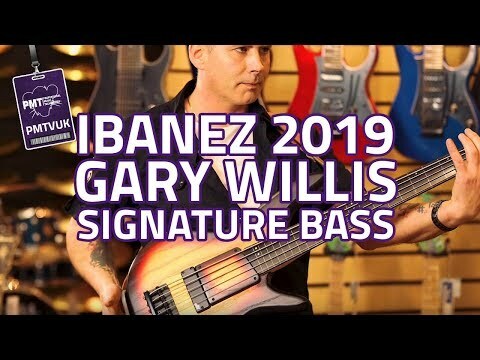 Two decades after his very first signature bass, and in celebration of this fantastic pairing, Ibanez have decided to release the Ibanez Gar..
Two decades after his very first signature bass, and in celebration of this fantastic pairing, Ibanez have decided to release the Ibanez Gary Willis Signature 20th Anniversary Fretless Bass. Featuring many of the hallmark specs as Gary's usual signature bass - such as the fretless fingerboard, finger ramp, and unique machine head shape - the GWB20TH-TQF still unique unto itself. With its slimline body contours akin to those of the SR Basses, and a super-sleek GWB neck adorned with a fretless ebony fingerboard, the GWB20TH-TQF is an absolute dream to play. Additionally, the Ash and Basswood tonewood combination naturally provides a range of sparkling highs, with a well-balanced tone. As a long-time user of Aguilar amps, preamps and pickups, it's only natural for Gary's signature bass to feature them too. Sitting in the body's bridge position you'll find a stunning Aguilar DCB pickup. Using dual ceramic magnets, this pickup provides you with a dynamic and responsive attack that's ideal for all play-styles. Featuring well-developed overtones and singing sustain, this pickup is the perfect match for a fretless bass. In addition to the pickup you get an Aguilar OBP-2 active EQ. This two-band EQ gives you up to 18dB of bass boost and cut at 40hz, and 16dB of treble boost and cut at 6.5 kHz, allowing you sit nicely in any mix. As with his previous signature models, the GWB20TH-TQF comes complete with a removable finger ramp. This little addition is perfect for helping you to develop your right-hand technique, ensuring that you never dig in too deep, and giving you a consistent sound however far away from your pickup you choose to play. Get in touch with us today if you'd like to know more about the availability of this stunning bass guitar. Order yours today and once it's arrived in stock you can make use of our Home Delivery or Store Pickup services!